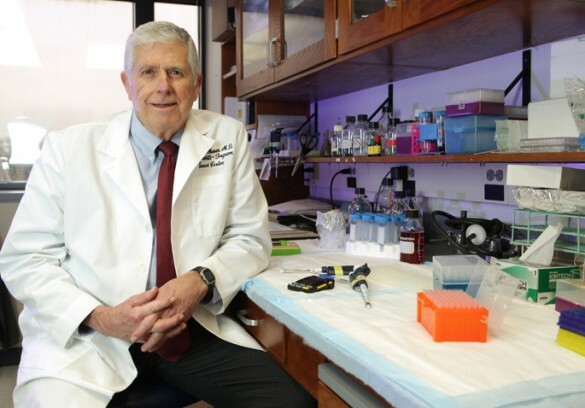 Harold L. (Hal) Moses, M.D., professor of Medicine and Pathology, acting chair of Cancer Biology and director emeritus of Vanderbilt-Ingram Cancer Center (VICC), has received the 10th annual American Association for Cancer Research (AACR) Award for Lifetime Achievement in Cancer Research. 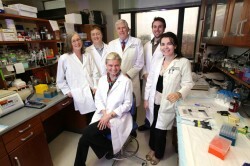 He received the award April 7 during the AACR Annual Meeting in Washington, D.C. He served as AACR president from 1991 to 1992. Moses was the founding director of what is now VICC, one of the nation’s leading cancer centers and one of only two National Cancer Institute-designated Comprehensive Cancer Centers in Tennessee. Its nearly 300 faculty members generate more than $140 million in annual federal research funding, ranking it among the top 10 centers in the country in competitive grant support, and its clinical program sees approximately 6,000 new cancer patients each year. For 20 years, Moses has also served as director of the Frances Williams Preston Laboratories at VICC, founded with support from the T.J. Martell Foundation. Within these laboratories Moses has led teams of cancer researchers who have focused on the molecular activity inside cells which can lead to the development of cancer. In the early 1980s, his laboratory isolated and purified transforming growth factor beta (TGF-b) and discovered that it could inhibit cellular proliferation. His group’s discovery of TGF-b as an inhibitor of normal cell growth opened the doors to the study of negative growth regulation, which represented a new model in cancer cell research. His work has had a major impact on scientists’ understanding of the disruption in the balance between positive and negative growth regulators as an underlying cause of cancer. One of the major discoveries from his research team is the finding that the loss of TGF-b signaling in some stromal cells results in the generation of cancer in the adjacent tissue. Much of his research has been related to cellular activity and growth in breast cancer, and the crucial discoveries from his research team have served as building blocks for other cancer scientists. Moses has also served as a mentor for scores of students and postdoctoral fellows who are now prominent scientists and thought-leaders in cancer research. “Hal is a world-renowned scholar. Those of us who have worked alongside him in his laboratory or who have been fortunate enough to receive his scientific advice and counsel are very appreciative of his exceptional mentorship,” said Jennifer Pietenpol, Ph.D., director of VICC. Moses is a highly acclaimed international lecturer and has served in numerous leadership roles in the cancer research community. He has served as president of the Association of American Cancer Institutes (AACI), co-chair of the National Cancer Institute (NCI) Progress Review Group and chair of the NCI Cancer Centers review panel. He is a member of the Institute of Medicine of the National Academies and was founding chair of the IOM’s National Cancer Policy Forum. Moses has been honored with the Earl Sutherland Prize for Achievement in Research at VU and the T.J. Martell Foundation Lifetime Achievement Medical Research Award. He graduated from Berea College in Kentucky and received his medical degree from Vanderbilt University School of Medicine, where he also completed his residency. He did his postdoctoral research training at the National Institutes of Health. He spent five years as a Vanderbilt faculty member and then joined the Department of Cell Biology at the Mayo Clinic in Rochester, Minn., before returning to Vanderbilt in 1985 as chair of the Department of Cell Biology.